Sigmund Rosenbaum, a Jewish boy, lives with a Catholic family as his mother has died when Sigmund had just turned three. Sigmund is fifteen years old when in November 1938 the Nazis set all synagogues on fire. His Catholic stepfather wants to save the boy. Luckily he comes to know of the British Quaker initiative to rescue Jewish children from the Nazi terror. Sigmund is one of the first who can join a “Kindertransport” and comes to England as early as December 1938. He ist taken to a Methodist couple in Wadebridge, a small town in Cornwall. They treat Sigmund well. Sigmund and Maria, called Rile, the daughter of his former German stepfather, manage to exchange letters as long as 1943. Thus, Sigmund learns about what is happening in wartime Germany while he in Cornwall experiences England at war. Sigmund’s best friend Nick, a Cornish boy, is drafted and sent to Europe in July 1944. Nick dies when the British troops cross the river Rhine in March 1945. Emigration, exile, identity, the search for a place to call home, the spiritual search of the soul for belonging to some greater unit than oneself are the recurrent topics of “Hotel Dellbrück”. 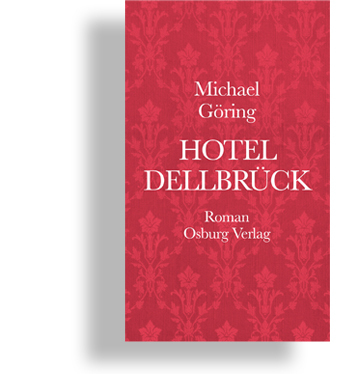 “Hotel Dellbrück” was first published in September 2018 by Osburg Verlag Hamburg. The novel has not yet been translated into English. Veranstaltung des Vereins "Gegen Vergessen – Für Demokratie"
Michael Göring was born in Lippstadt, a city of around 50.000 people in Westphalia, Germany. He studied English and American Literature, Social Geography and Philosophy at Universität Köln, the University College of Wales in Swansea, Ludwig-Maximilians-Universität München and Wayne State University Detroit. He was fellow of the German National Merit Scholarship Foundation and finished his PhD in English Literature in 1986. After that he worked as assistant professor in the English Department of the Ludwig-Maximilians-Universität München before he joined the world of foundations in Bonn and later in Essen. In 1997 the ZEIT-Stiftung appointed Michael Göring as executive member of the board of directors, in 2005 as chairman of the board. The ZEIT-Stiftung is a public benefit foundation established by the late Gerd Bucerius in 1971. With Gerd Bucerius’ death in 1995, the ZEIT-Stiftung became one of the ten biggest privately endowed foundations in Germany. Beside his work as CEO of the ZEIT-Stiftung Michael teaches the management of fine arts and not for profit institutions at the Hamburg School (University) of Music and Theatre. He has been member and chairman of the German National Association of Foundations in Berlin and is engaged with many foundations, art institutes and also with banks. Next to books and articles on foundations Michael has published four novels so far: „Der Seiltänzer” (2011), „Vor der Wand” (2013), „Spiegelberg” (2016) and „Hotel Dellbrück” (2018). Up until now there is no English translation of any of these four novels.